LAU welcomes John J. Fernandes, president and chief executive of the Association to Advance Collegiate Schools of Business (AACSB) to discuss the importance of accreditation in today’s world. Fernandes began his tenure with AACSB International in 2000 and has been instrumental in transforming the organization into the most highly respected global accrediting body for management education. On December 5, LAU Beirut welcomed John J. Fernandes, president and chief executive officer of the Association to Advance Collegiate Schools of Business (AACSB), a major US based global accrediting agency. The five-day visit that aimed at introducing Fernandes to the university kicked off with a lively discussion that gathered deans and senior administrators of prominent schools of business from Lebanon and the region. The event centered on the importance of accreditation in today’s interconnected, globalized world, as Fernandes offered valuable insights drawn from his countless years of experience in the field. Established in 1916, AACSB International is a not-for-profit organization of more than 1,000 collegiate schools of business, corporations, and other organizations in more than 70 countries devoted to the advancement of higher education in business administration and management. The importance of seeking and getting accreditation is, according to Fernandes, twofold; it has an internal and external dimension. “When a school readies itself for accreditation, it either re-evaluates, re-confirms, or re-decides its mission; that’s the most important thing, because mission tells the outside world, and the inside world what the school means,” Fernandes explained. Pursuing accreditation through AACSB is a rigorous and intensive process. By hosting and attending the event, LAU and business school administrators have demonstrated the strength of their commitment to educational goals and quality management education. LAU President Dr. Joseph G. Jabbra stressed that accreditation is “a journey, not a destination” and emphasized the university’s mission of continuous excellence and continuous self-improvement. “Earning accreditation is a voluntary process requiring significant commitment, self-assessment, peer review and dedication from a school’s administration,” explained Jabbra. In recognition of Fernandes’ extraordinary leadership, the Academy of Strategic and Entrepreneurial Leadership created an award in his honor. The John J. Fernandes Strategic Leadership Award is bestowed upon a dean, provost, president or other senior academic leader who demonstrates exceptional leadership abilities. The first awardee of this international accolade was LAU Provost Dr. George K. Najjar last October. “In today’s globalized world we have to speak the same language, to ensure the same high quality and standards,” explained Najjar. “LAU will continue to facilitate the process of pursuing excellence in education management in the country and in the region,” he added. 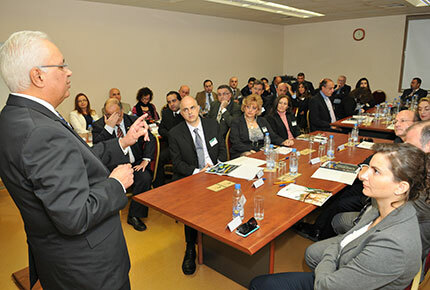 During the visit, LAU facilitated individual meetings between Fernandes and interested deans of schools of business.